Situated high on a bluff overlooking the May River, Bluffton continues to be one of South Carolina's fastest growing small towns. The population has nearly doubled since the 2000 census, largely due to the temperate climate, affordable housing and low cost of living. At one time a tiny community, the recent annexation of 32,000 acres made Bluffton the fifth largest town in South Carolina by land area. Most of that land is still being developed, but government officials and residents are committed to maintaining the town's rich historic heritage.
" 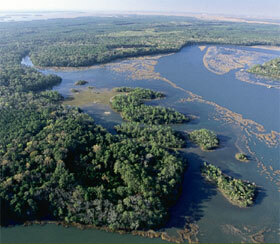 Sportsmen will enjoy Bluffton's proximity to both freshwater and saltwater fishing. ... "
It was the town's long-standing reputation for secessionist rhetoric that led to its complete destruction at the hands of an overwhelming force of Union soldiers on June 4, 1863. When the dust settled, dozens of churches, homes and other buildings were all but gone. Sportsmen will enjoy Bluffton's proximity to both freshwater and saltwater fishing, while landlubbers can choose from a variety of activities, such as golf on one of the two dozen nearby courses. Bluffton is just a short drive from the beaches, fine dining and shopping available in Hilton Head Island and the historic city of Savannah.